The Government has slashed salaries of 500 primary school teachers from about sh360,000 (139 USD) to sh310,000 (119 USD). Public service ministry permanent secretary Adah Muwanga announced the changes in a May 31 letter. In the letter, Muwanga asked town clerks and chief administrative officers to submit names of the affected teachers to their district service commissions for resignation. Muwanga said the teachers, whose salaries were affected, had irregularly been appointed as assistant education officers. “The recruitment was irregular because the position of assistant education officer was not provided for in the primary school establishment,” she noted. The development comes at a time when teachers are demanding a salary increment and James Tweheyo, the secretary general of the Uganda National Teachers Union, said the action would only spell doom. 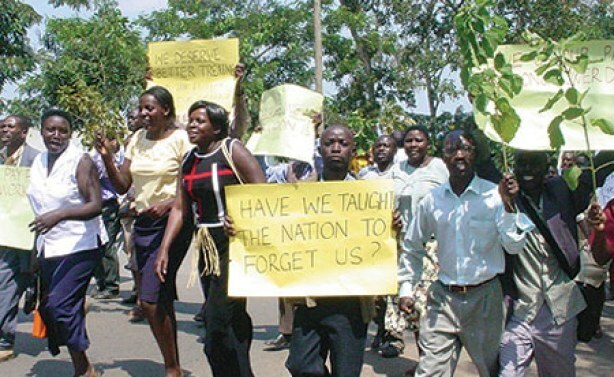 Teachers in Uganda are threatening strike action for a living wage. As is happening in both Kenya and Nigeria, the government has long promised increases which have not been forthcoming. In the case of Uganda, teachers had been promised a 20% pay rise, but the government failed to budget for it and the money has been withheld. As a result, the Ugandan National Teachers Union has given the government notice that if it fails to fund the increase, they will go on strike from next term. This is only the latest episode in an ongoing struggle for proper education funding and rremuneration of teachers in Uganda. As a Ugandan NGO put it at the time of last year's teachers' strike in the country: "the quality of education in public schools has over the years declined compared to that in private schools something that is attributed to less funding to the schools and poor teacher remunerations. The two day strike will help remind government of its obligations to increase funding in public schools to help the learners there attain a better education when teachers are adequately remunerated." Yet the government is still refusing to pay the teachers a wage which allows them to survive, leave alone live well.